Lahaul and Spiti remote Himalayan valleys of Himachal Pradesh, lying on the Indo-Tibet border. Strange, exciting primitive these valleys are unsurpassed in mountain shape, in the rugged beauty of their rocky escapements and the splendor of their snow covered peaks. Lahaul is marked a central mass of almost uniformly high mountains and massive glaciers. The two rivers, Chandra and Bhaga which rise on either side of Baralachala flow through the Chandra and Bhaga narrow valleys. Lahaul is also fascinating area of Buddhist art and culture. The monasteries of Lahaul- Spiti are rich repositories of ancient murals, thankas, wood carving and golden images of Padmasambhava. Leave by train/Coach and arrive Amritsar at the lunch time. Meeting and you will be transfer to the hotel. Afternoon visit Golden temple and Wagha border to see the sunset flag cermoney. Overnight at Hotel. Six to seven hours drive will take us to Dharamshala and arrive at the noon. Afternoon visit Dalai Lama monastery and the market of Mecleod Ganj. Overnight at Hotel. Full day drive will take us to Shimla and arrive in the evening. Overnight at Hotel. Day to visit Mall road, museum and Kufri and time in connection with formalities for the inner line permission. Overnight at Hotel. This is our first day for the adventure and full day drive via Narkanda and Rampur finally we reach Sarahan which commands a view of Srikhan Mahadev Peak. A mixture of Hindus and Buddhist architecture and you may visit ancient temple of Bhimakali. Overnight at Hotel/tents. The Baspa valley is the prettiest valley in Himachal drive via Karchham 32 Kms and reach Sangla built on a slope with the houses rising one above the other with Gigantic Kinnar Kailash peak dominating the scene. Overnight in tents. Drive from Sangla to Kalpa 2759 Mtrs which is the district headquarter of Kinnar once a favorite haunt of Lord Dalhousie. In front of Kalpa is an impressive view of Raldang Kailash massif across the Sutlej river. Overnight in tents. Drive to Yangthang which is 86 Kms and arrive Tabo after 27 Kms drive from Sumdo. The ancient village Tabo 3050 Mtrs. 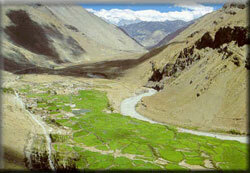 situated on the left bank of river Spiti. It is the seat one of the most famous Buddhist monastery regarded next to the Tholong Gompa in Tibet. The monastery contains large number of scriptures and pieces of art, wall painting and Stucco. It is also know as Ajanta of Himalayas. Overnight in tents. Leave Tabo after one and half hours drive reach Dankar Gompa visit the Gompa and continue drive to Kaza situated at 3600 Mtrs at the foot of steep ridges and on the left bank of river Spiti is the Ki Monastery which is the biggest Monastery in Spiti and is located between Kibber and Kaza, hundreds of Lamas receive their religious training in this monastery and is famous for its Murals and Books. Afternoon visit the monastery of Ki and Kibber. Overnight in tents. Drive from Kaza to Kunzumla pass 76 Kms which is (4590 Mts) highest pass on Spiti Lahaul road and drive to Khokhsar another 45 Kms drive will take us to Keylong and visit the town. Overnight at Hotel/tents. From this day we drive on Leh route and the road winds through extensive fields and long river of Bhaga on the way we stop at Darcha for Passport check. Darcha is the base point for many different trekking routes. Continue drive to Baralachla pass 4883 Mtrs. There is a lake known as Surajtal and it is worth to stop here for pictures. Finally we reach Sarchu which is the boundary line between Himachal and Jammu n Kashmir state. Tonight our camp will be at an altitude of 4200 Mtrs. And it will be the coldest night during the whole tour. Overnight in tents. Leave early morning drive through Lachungla Pass 5065 Mtrs rugged in the middle of mountains. At lunch time we stop at Pang. From here there are chances to see tiny colonies of Marmots on the Morea plains a streatch of 45 Kms. Finally we reach the second highest road TANGLANGLA PASS 5350 Mtrs. Finally we reach Leh in the evening. Overnight at Hotel. Morning at leisure. Afternoon half day excursion to Spituk, Phyang and Shanker Gompa. Overnight at Hotel. Full day tour of Shey, Thiksey and Hemis monastery. It is interesting to start early morning to see the praying Cermoney at Thiksey. Return to the hotel in the evening. Overnight at Hotel. Morning half day tour of Stok Palace/Museum and on the way back visit Tibetan Refugee Camp at Choglamsar. Afternoon visit by foot to King's Palace and Tsemo Gompa which commands magnificient view of the Leh town. Overnight at Hotel. Today is the last day of our tour one may visit to Srinagar by road/flight or fly back to Delhi .